• Less than 100% to zoom out for an overall view. • Press and hold down the mouse button to anchor one comer of the selection rectangle. • Without letting go of the mouse button, move the mouse so as to enclose everything you want to select inside the selection rectangle. • Once the selection rectangle encloses everything you want to select, release the mouse button. Mathcad encloses those regions you have selected. 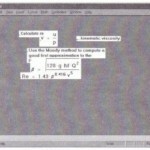 Figure 3-2 shows how the worksheet might look just before you release the mouse button. Figure 3-2: Several regions enclosed in a selection rectangle. • Select the regions as described in the previous section. • Choose Copy from the Edit menu. This copies the selected regions into the clipboard. • Click the mouse wherever you want to place a copy of the regions. You can click either someplace else in your worksheet or in a different worksheet altogether. Make sure you’ve clicked in an empty space. You should see the crosshatch. • Place the pointer on the border of any selected region. It should turn into a small hand. • Hold down the mouse button. • Without letting go of the button, move the mouse. You’ll see the rectangular outlines of the selected regions move as you move the mouse. At this point, you can either copy the selected regions to another spot in the worksheet, or you can copy them into another worksheet. 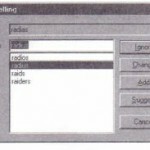 To copy the selected regions to another spot in the worksheet, move the rectangular outlines to wherever you want to place the regions and let go of the mouse button. If you want to copy the region to a spot beyond what you can see in the window, just drag the regions in the appropriate direction. Mathcad will automatically scroll in that direction. To copy the selected regions into another worksheet, press the mouse button and drag the rectangular outlines toward the destination worksheet. Do not linger near the window’s frame; drag the regions decisively across the frame and into the destination worksheet. 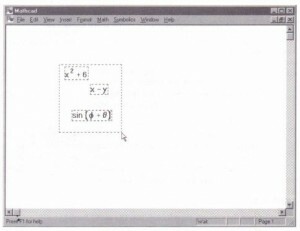 Mathcad responds to hesitation near the window’s frame by auto scrolling the document in the indicated direction. • Place the pointer on the border of any selected region. The pointer will turn into a small hand. • Press and hold down the mouse button. • Choose Cut from the Edit menu. This deletes the selected regions and puts them on the clipboard. • Click the mouse wherever you want the regions moved to. Make sure you’ve clicked in an empty space. You can click either someplace else in your worksheet or in a different worksheet altogether. Make sure the cursor looks like a crosshatch. • Choose Paste from the Edit menu.